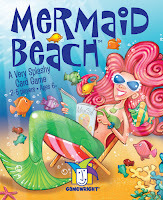 Board Game Store : EuroGames : Strategy Games : Puzzles : Off The Charts Games: New Portland game inventor hits the beach! 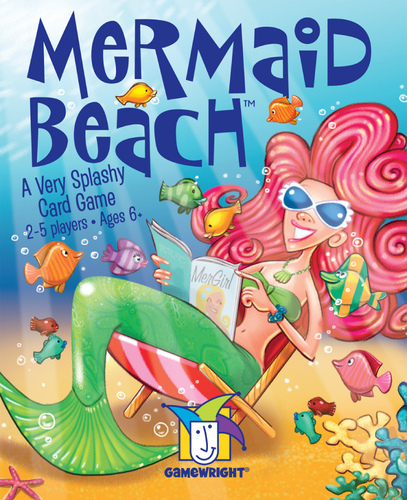 New Portland game inventor hits the beach! We support local game inventors! In this week is Mermaid Beach invented by Portland's Emily Ehlers. "On her 12th birthday this year, Emily Ehlers, a seventh-grader at West Sylvan Middle School, received a mysterious package from Massachusetts. "I had a small suspicion that it was my game, so I opened it." She beams, the delight of the moment still evident. Inside the package was a game, Mermaid Beach. 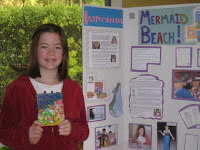 She had dreamed up the ocean-themed card game when she was in third grade. Four years later there it was, professionally produced and packaged by Gamewright, maker of popular family games like Slamwich, Rat-a-Tat Cat and Sleeping Queens. She was officially a game inventor." "Emily and her family spent her third-grade year sailing a boat down the East Coast of the United States and on to the Bahamas. She and her brothers, Jake and Drew, were home-schooled for the year. They spent time playing games, including Sleeping Queens, Emily's favorite. "When I found out it was invented by a girl, I wanted to do that too," she says." Lisa 'Bowman' Steenson - Gut Bustin' Games: Redneck Life, Trailer Park Wars, and Oh Gnome You Don't! For these and other fun-tastic games come in and visit us at Off The Charts Games. We are located in the historic downtown Gresham at 30 NW 2nd St., Gresham, OR 97080.